Following our (Roy Williams, Simone Gumtau and me) last publication in IRRODL – Footprints of Emergence – we have continued to think about the factors which influence the potential for emergent learning in any given learning environment or curriculum. This week Roy has run a workshop at the Digital Pedagogies Unconference at University College, London. At an unconference you are never quite sure whether or not you will get a hearing, but Roy did get a slot and had an interesting discussion with those who attended. Finally we are delighted that our proposal for a workshop (one of only 11) has been accepted by ALT-C for their conference in September – Building New Cultures of Learning The last ALT-C Conference I went to was in 2005. As fortune would have it, Stephen Downes was a keynote speaker then and will be again this year in 2013. I am looking forward to hearing hime speak again. I can still remember the keynote he gave in 2005. 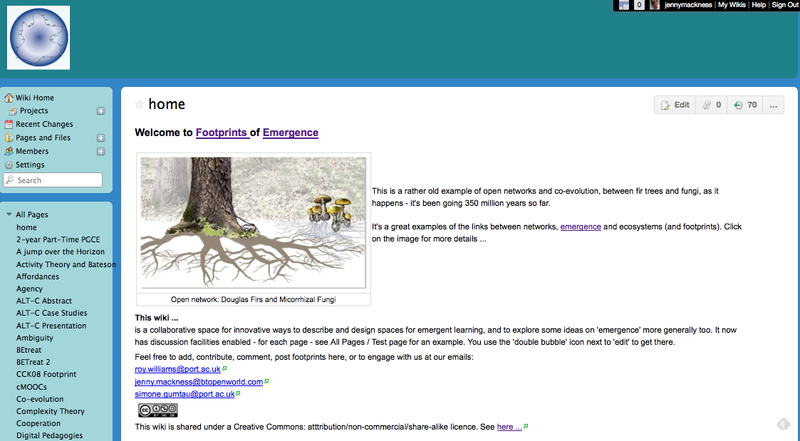 We have posted details of the workshop we will run at ALT-C 2013 in our open wiki – Footprints of Emergence (I should say Roy’s open wiki – he is the one who does most of the work on it :-)). See ALT-C Presentation for an outline of our session. We are still working on the wiki and expect it to have changed and developed before September when the ALT-C conference runs. So, there’s lots to work on in the coming months.